These Spiced Roasted Almonds are perfect for a salty, crunchy, healthy snack. 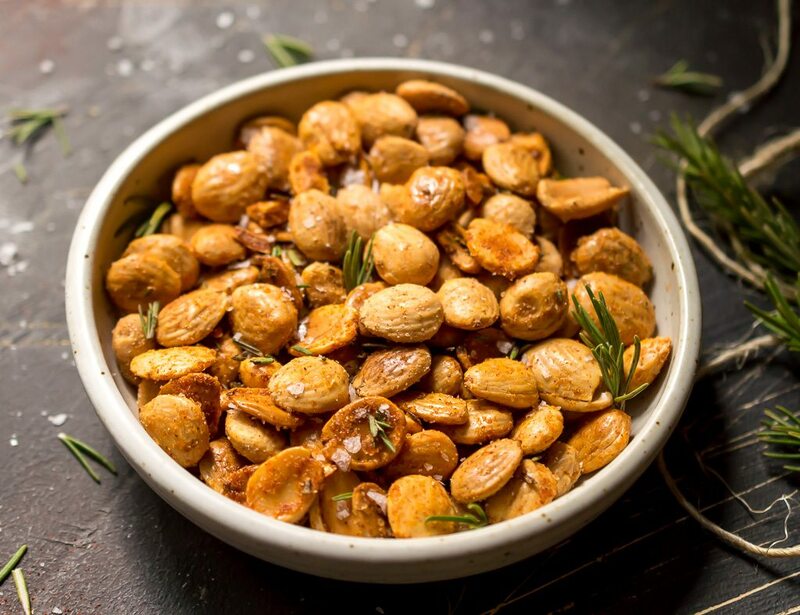 Instead of slow roasting, these marcona almonds are toasted quickly on the stovetop then tossed with garlic powder, smoked paprika, sea salt and fresh rosemary. This 5 minute, 5 ingredient recipe is great for nighttime munchies or a snack on-the-go! I get my crunchy-salty cravings at night. We do a lot of movie nights at my house and I have always sat with a giant tub of butter flavored popcorn with extra ‘fake’ butter! ???? Those food rituals are the most difficult habits to change. I’ve had to find alternatives to the salty buttery popcorn. These Spiced Roasted Almonds make a great substitute. 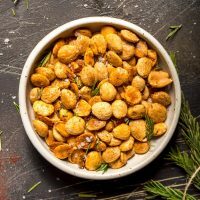 They are salty, crunchy and can be made in almost the same amount of time as microwave popcorn! Now I can be afraid of the scary movie I’m watching instead of the weirdly delicious chemicals I’m eating. If only I could convince my daughter that spiced nuts were better than buttery popcorn and candy. I pick my battles and I’m saving that battle for another day ???? Your preferred liquid frying oil will work for this recipe. I like to use Avocado Oil but Extra Virgin Olive Oil will work too. We aren’t cooking these long enough to burn the olive oil. What type of almonds should you use? No special tools required for these easy roasted almonds. You’ll need a good pan, my favorite are these Anolon Hard Anodized Nonstick Skillets . A knife and cutting board for the rosemary, I’m sure you already have those in your kitchen arsenal. 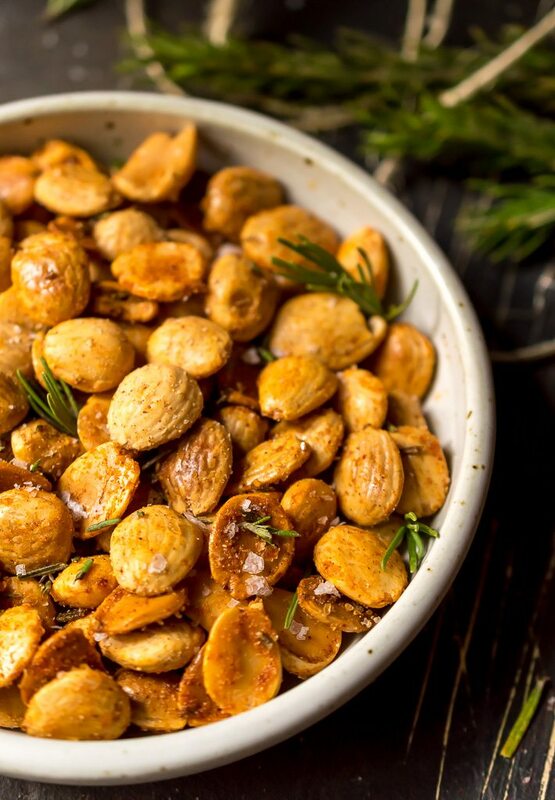 Do Not walk away from the stove while cooking these roasted almonds! They need to be stirred frequently and if there is any hint of burning, you’ll want to remove them from the heat immediately. Dried rosemary will work too. In fact, feel free to use whatever spices are your favorite. These would be great with adobo seasoning, french spice blends, jerk seasoning . . . the flavor combinations are limitless. Almonds aren’t your favorite nut? (If this is the case I’m not sure why you are here reading this ????) But, no worries. 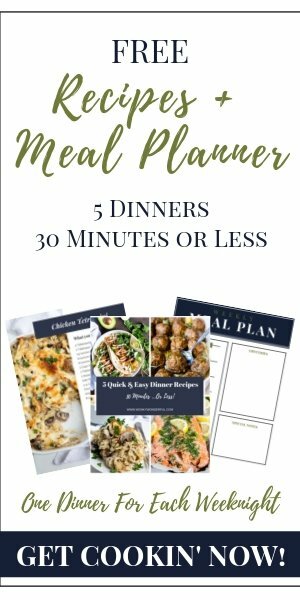 Use walnuts, cashews or pecans instead. Heat oil over medium/high in a large skillet. Add almond. Fry while stirring frequently for 4-5 minutes. 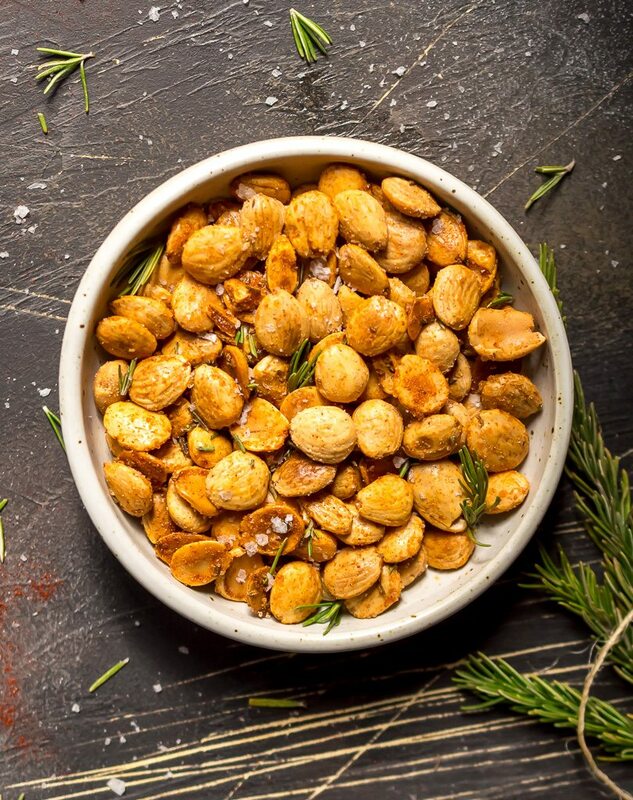 Stir in rosemary and remove almonds from heat. Transfer almonds to a large bowl. Add spices and salt. Toss until evenly coated with seasoning. Serve warm or cooled. Store leftovers in an airtight container. These sound absolutely delicious!! It’s like savory candied nuts!